AN independent TD was described as being like a dog – “always scratching” - amid fiery Dáil scenes over political pay and allowances. 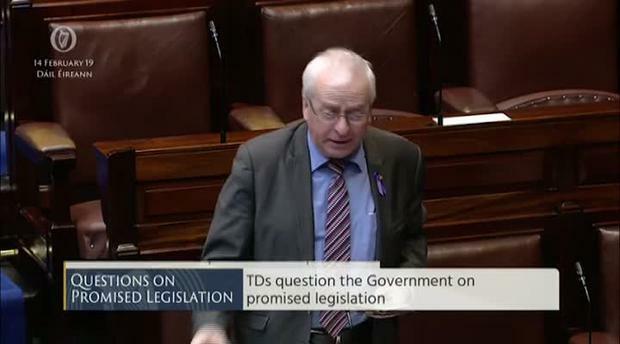 Rural Affairs Minister Michael Ring clashed loudly with Tipperary’s Mattie McGrath as other TDs roared with laughter. The shouting match started after Mr McGrath called for a review of the budget for ministerial press advisers. He said €6.5m has been spent on advisers in the past two years. “Ministers employing special advisers and media advisers, in other words, spin doctors yet the Government is telling the nurses it cannot pay them,” he said. The Independent TD claimed ministers were allowed to make appointments “willy-nilly whenever they wish, bring in their friends in the press and cosy up to them”. More than half a dozen members of the media have left journalism over the past two years to take backroom jobs as advisers to ministers. However, Mr Ring immediately hit back and called on the TD to “give back the €40,000 he gets as an Independent”. The allowance is paid in order to help independent members of the Dáil carry out their work. Mr Ring said that the Opposition TD had an opportunity to be part of government after the last election. The Ceann Comhairle tried in vain to restore order to the House but the two men continued to shout insults. “I would not go near ye. It is all supply and no confidence. I am asking you to give back the €100,000,” Mr McGrath said. David Raleigh Carmel Collins and her family stood up to intimidation from the gangland thugs who murdered her son Roy so other families would not have to suffer a similar hell, her funeral Mass was told. Kevin Doyle Lyra McKee's murderer is still at large today and the Northern Ireland Assembly is closed but neither should remain that way for long, her funeral heard yesterday. Kevin Doyle None of it made any sense. None of it made any sense.